So We've Been Super Busy Lately-Which Is Nothing Unusual :) Last Thursday My Son Went On A Field Trip To The Pumpkin Patch, So My Husband, Little Sister C & I Tagged Along! The Weather Was Perfect & Of Course We All Had Alot Of Fun! Saturday We Had Little Sister C's Second Birthday Party! They Grow Up So Fast! We Had Yummy Strawberry Cupcakes & A Princess Themed Party! It Was So Much Fun! :) It's Always Nice To See Friends & Family! So Have You Taken Your Children To The Pumpkin Patch? Any Exciting Events Coming Up For Your Family? 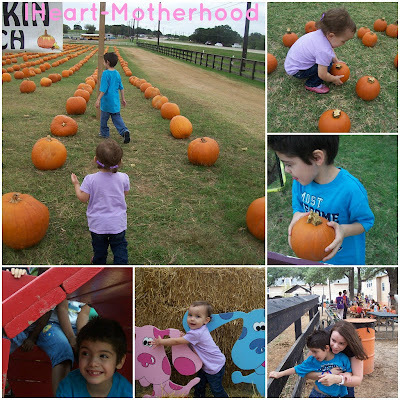 It looks like the kids had a great time at the pumpkin patch! And Happy Birthday to C! I hope her princess party was fabulous! What a fun day and a terrific birthday party! The pumpkin patch looks fantastic, I do like how the pumpkins are all lined up. My kids always loved pumpkin picking.